Some of the best and most creative food on North America’s west coast is being done in Baja California. “Baja Med” cuisine takes the bounty of Baja California’s shores and valleys and the classic flavors of Mexico fusing them with the ingredients and flavors of Asia and the Mediterranean. It is a Chef-driven cuisine that is, increasingly, sending its tendrils deeper into the fabric of Northern Baja. Amongst the Chefs most associated with the Baja Med movement are Miguel Angel Guerrero (La Querencia), Javier Plascencia (Misión 19) and Jair Tellez (Laja). Depending on whom you ask, any one of them might have been the father of Baja Med cuisine with Guerrero being mentioned most often and Plascencia not far behind. There is much to explore in this new culinary world fermenting only a few miles south of my house in San Diego. Having just returned from a trip to Baja and having been so taken by the Campechana seafood cocktail at San Felipe’s El Huitussi (http://sdfoodtravel.com/san-felipe-restaurant-review-mariscos-el-huittusi/) I decided to start with those flavors. 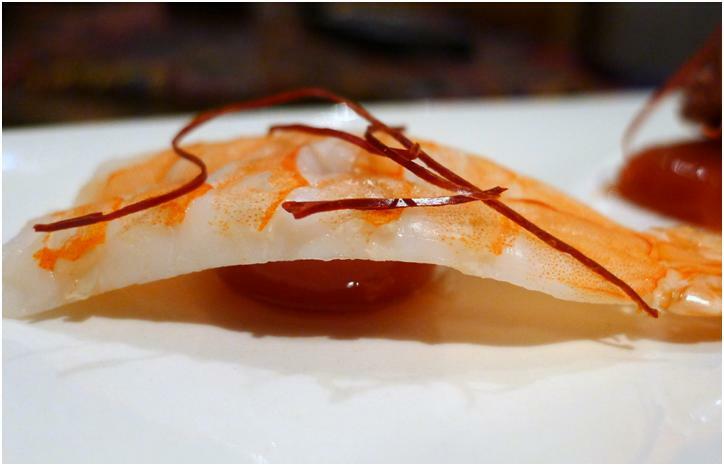 Playing on the parallels between sushi and ceviche, I did a simple deconstruction of the Campechana using the modern gastronomy gel technique from http://sdfoodtravel.com/modern-gastronomy-spot-prawns-with-bacon-snow-tomato-prawn-gel-and-nuoc-cham/ to replace both the sushi rice and the seafood cocktail’s soupy sauce. Make the Campechana Gel. Put all of the ingredients except the agar agar powder in a large mixing bowl and whisk to combine. Transfer 2 cups of the liquid to a large sauce pan and bring to a boil. Sprinkle in the agar agar powder and mix thoroughly with a wire whisk. Bring the liquid back to a boil until the liquid visibly thickens. Pour the liquid into a tray of candy (or small cupcake) molds and refrigerate until the gels are set. 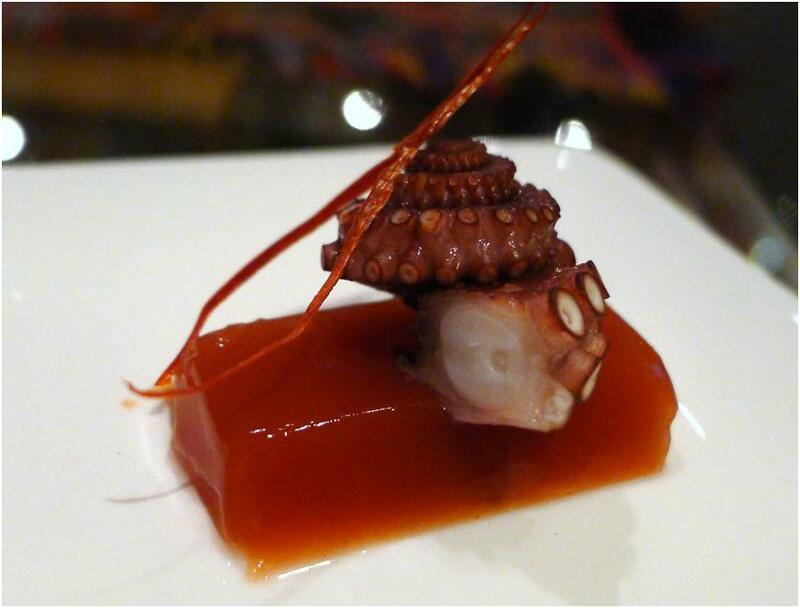 Prep the Octopus. Cut the Octopus tentacles into bit size (and attractive) pieces. “Cook” the Scallops. Cut the Sea Scallops into quarters and combine with the lime juice in a non-reactive bowl. After about half an hour, with the surface area of the scallops, the ceviche should be done. Plate the Dish. Remove the Campechana Gels from their molds, arranging three on each plate. Top each gel with a piece of the scallop, a shrimp and a piece of octopus, respectively (as if they were sushi toppings). Garnish each piece with a few strings of the Korean chile threads. Come on down! Any time!